Wurzel Fudge - The Songs That Adge turned Down! Wurzels fans may be interested to know of two songs which were written especially for Adge Cutler and The Wurzels but which they never recorded. According to music historian and singer/songwriter Ian Whitcomb, these two songs were written by a duo with the unlikely sounding names of Sturminster Newton and Melbury Bubb (which are two places in Dorset). The songs Wurzel Fudge - The Village Idiot and Wurzel Fudge In London Town were offered to Adge, but apparently the band and their record producer Bob Barratt considered the words to be potentially offensive to West Country folk, so they turned the songs down. In Ian's book Treasures of Tin Pan Alley, Ian reveals the true identity of Newton & Bubb - himself! Ian has confirmed that as far as he can recall, the song Wurzel Fudge - The Village Idiot was rejected by both Adge's producer at EMI Bob Barratt and by comedian Benny Hill for similar reasons, i.e. they were worried about causing offence to country folk. It therefore seems unlikely that either of these songs were ever recorded by Adge. The follow-up song Wurzel Fudge in London Town was used in a 1976 BBC documentary made by Ian entitled LA - My Home Town. Ian Whitcomb later recorded the songs on his album Red Hot Blue Heaven, which is how we found out about them. Incidentally, Ian wrote the song Down On The Farm which was recorded by Adge Cutler & The Wurzels and released on their fourth album Carry On Cutler! in 1969. Ian also released a version of Down On The Farm in 1970, and US readers may like to know that yes, he's the same Ian Whitcomb who had a big US hit with You Turn Me On in 1965 (the record unfortunately sank without trace in the UK). 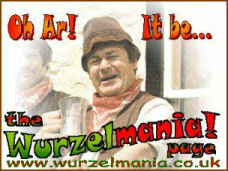 See Ian Whitcomb's website for further information and an audio clip of Wurzel Fudge - The Village Idiot.